There are 19 workshops that offer WYSTC 2018 delegates quick, 20-minute doses of expert insights on everything from technology, to sales strategy, to market research, destinations, sustainability, and branding. The WYSTC workshop programme kicks off on Wednesday, 19 September at 12:20 – join WYSE Travel Confederation’s Greg Richards and Wendy Morrill for a look at the big takeaways from the largest global study on youth travel, New Horizons IV. Research findings on hostels, Airbnb, and OTAs like Booking.com, Hostelworld, and Expedia will be presented later Wednesday afternoon at 16:10 during the workshop New Horizons IV: De-bunking youth travel accommodation. Destinations will get the spotlight on Thursday, 20 September with Cuba, Australia, Argentina, Ecuador and the Galapagos Islands featuring in workshop presentations. Tech for travellers while in destination will also be discussed in workshops on Thursday by Travello and Legaroo. Exclusive, not-yet published city ratings from New Horizons will be presented early Thursday morning. 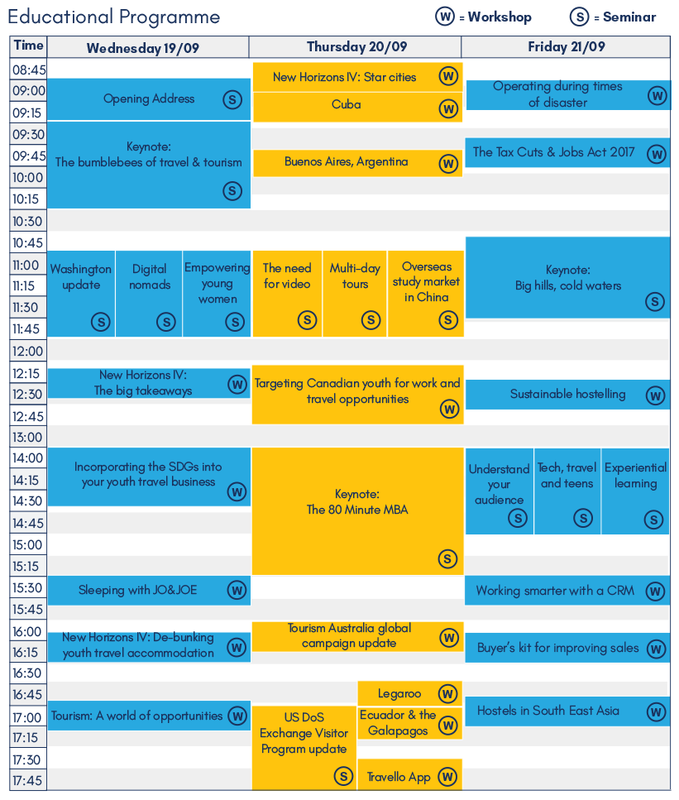 Tools, resources, and best practices will be shared during workshops on Friday, including tactics for improving sales, doing smarter business with CRM, offering sustainable hostelling opportunities, changes to US tax law that affect J1 programme participants, and operational resilience in the face of extreme challenges. This is just a small selection, so if you have a free slot in your schedule, consider stopping by the WYSTC workshop area to listen in or check the WYSTC Handbook for the full schedule.